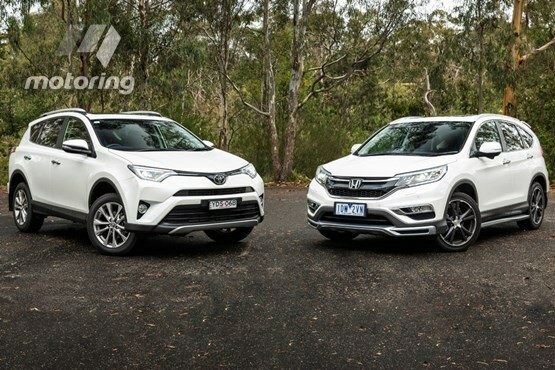 Ask any car enthusiast with half a clue about SUVs whether buyers would cross-shop the Toyota RAV4 against the Honda CR-V and the answer would likely be a resounding no. In the medium SUV segment the Honda is actually one of the also-rans, selling 8608 vehicles last year – a respectable but hardly startling figure. In contrast, the RAV4 sold 18,435 vehicles last year – nearly 10,000 more than the Honda. Measured against the Toyota (and a host of other rivals), the Honda is one of the slower sellers in the segment. Perhaps buyers are reluctant to buy a car that more closely fits the mould of an American-style crossover. The RAV4 isn’t ultimately the most focussed off-road wagon in the medium SUV segment nor is it exactly pillow-soft. The CR-V, on the other hand, is aimed much more at traditional car buyers – those (barely) willing to risk a toe in the icy-cold waters of SUV ownership. A phrase you will soon grow tired of reading in this comparison is ‘car-like’, applied to the Honda. Read more on the Motoring website, and find out more about the Toyota RAV4 on the Milton Toyota website.